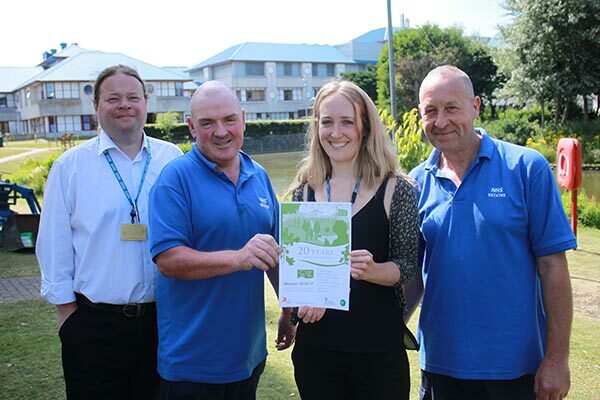 The Royal Bournemouth and Christchurch Hospitals NHS Foundation Trust is the first hospital trust in the UK to receive a Green Flag Award for maintaining its green spaces to a high standard. The Green Flag Awards, run by government charitable organisation ‘Keep Britain Tidy’, recognises and rewards the best parks and green spaces across the UK. 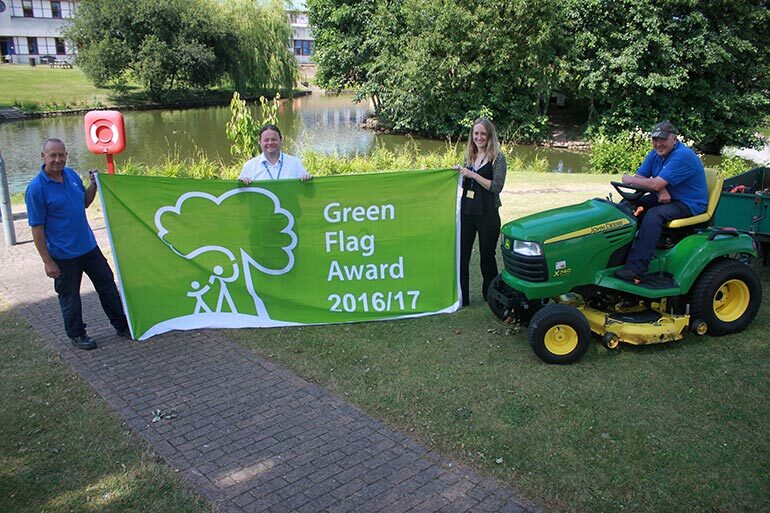 The Green Flag Award acknowledges the efforts of the Estates Team at the Royal Bournemouth Hospital, who produced and implemented a detailed Biodiversity Management Plan. The plan included the development of the areas surrounding the hospital’s lake, which is mainly dominated by planted mixed woodland and patches of grassland. The area is home to a range of diverse plants and creatures, from birds such as ducks, herons, moorhens, woodpeckers, cormorants and kingfishers to koi carp and ornamental goldfish. Maintaining the green areas in the hospital grounds are a key part of the Trust’s commitment to providing high-quality care to patients, as research shows outdoor spaces not only improve mental health, but support and aid recovery. Studies show patients who are happy with their healthcare environments are easier to care for and return home sooner. Green spaces also provide opportunities for exercise to aid recuperation. Evidence shows gentle exercise in a green space can reduce the risk of heart attacks, strokes and diabetes by 50 per cent, fractures of the femur, colon cancer and breast cancer by 30 per cent, and Alzheimer’s by 25 per cent. “All the flags flying this year are a testament to the efforts of the thousands of men and women, both staff and volunteers, who work tirelessly to maintain the high standards demanded by the Green Flag Award” he said. For more information about patient services and green spaces at RBCH, please visit www.rbch.nhs.uk.